There is a moment in the Netflix holiday special “A Very Murray Christmas” that you might not miss, necessarily, but could easily kind of gloss over, in which Bill Murray (as himself) takes a phone call and comically hangs up on the person, a person who turns out to be his sister. It’s funny, right; he’s just another self-absorbed star. Ah, but Mr. Murray’s director, Sofia Coppola, rarely makes unintentional decisions, and this seemingly innocuous bit of jocularity hangs over “A Very Murray Christmas” like a sad-eyed angel at the top of a Charlie Brown Christmas tree. After all, Bill is often alone in this special named for him, save for Paul Shaffer, situated throughout at a virtually omnipresent piano, the Graham Stark to Murray’s Peter Sellers. But then, even Paul admits he’s just there for the steady paycheck. And so while “A Very Murray Christmas” is very funny and joyful, it is also infused with notable melancholia, a reminder that the season isn’t just silver and gold, but sometimes blue. The film opens with disconsolate, tuxedoed Murray, his bow-tie conspicuously undone, singing “Christmas Blues” (“The happy crowds are mingling / But there's no one that I know”) as if he’s Dean Martin and the rest of the Rat Pack has abandoned him. It’s a moment that no actor alive is more equipped to effect. 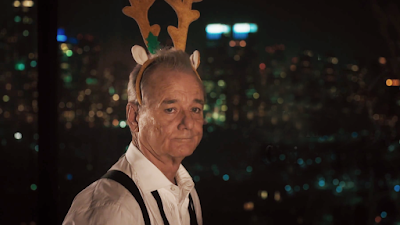 Murray pushes past the inherent comicality of novelty reindeer antlers atop his head to find the very real sorrow of the moment as your laughter gradually subsides and you just feel…wistful. He simply wants his Christmas special, live from the Carlyle Hotel, to go forward, but none of his booked guest stars can get there because a raging blizzard has completely shut New York City down. His frantic managers have more or less given up hope, and so has Bill, until he miraculously encounters Chris Rock and conscripts the unwilling comedian in a “Do You Hear What I Hear?” sing-along improbably re-claiming the old standard from Perry Como and twelve million malls via a simultaneously earnest and tongue-in-cheek rendition that earns two thousand bonus points for looking like the cover of “Bookends” with holly corsages. The evening could be a hit! Then the power goes out. Another movie might have taken this electrical outage as a cue to manufacture a television show anyway with a little production jerry-rigging, but not “A Very Murray Christmas”, which in keeping with the charmingly extemporary attitude of its star sticks to a leisurely gait. In his despondency, Bill finds a bunch of others bummed about being stuck on December 24th with nowhere to go, and together they try and foster some holiday spirit by more or less singing their blues away. He meets a couple would-be newlyweds (Rashida Jones and Jason Schwartzman) whose wedding has gone awry on account of the weather. He cedes the stage to the French band Phoenix, posing as the Carlyle’s kitchen staff, to sing “Alone on Christmas Day”, a solid offering of original winterland wistfulness. He performs a duet of “Baby It’s Cold Outside” with indie icon Jenny Lewis, playing a hotel waitress, who croons while Murray is more content to play down the song’s infamously creepy lyrics by seeing if he can get his duet partner to break character which she doesn’t because she’s goddam singing royalty and everything she does is perfect and no I’m not unfairly biased in her favor. And Maya Rudolph steps in to stop the show by standing in for Darlene Love on “Christmas (Baby Please Come Home).” None of this amounts to anything like a real narrative, nor should it. This isn’t a Russian winter in a Russian novel; this is a holiday hang at the Carlyle. Eventually, however, this hang gives way to an extended fantasy sequence, one where George Clooney materializes to make martinis at Paul’s piano and Sofia smartly peels away all the extraneousness that usually comes with Miley Cyrus and has the youthful starlet simply sit down and really rip “Silent Night”, a version that sounds more cabaret-y than Lutheran Church-y, which makes it appropriate that she’s wearing a fairly revealing Santa outfit while still singing about the Savior being born. And if this sequence, with its white lighting and Clooney’s 59 carat smile feels out of step with the preceding laid-back karaoke-ish misadventures, well, of course it does. This is how Bill imagines his Christmas special might have looked if it hadn’t gotten called on account of a snow day. It’s grand, yes, and yet that makes what transpires before it come across even sweeter, and triumphant, really, in its elegantly shaggy way. The holiday season, with its stress, sadness and occasional disrupting blizzards, rarely turns out the way we see it in our dreams, but, all in all, don’t be surprised if the spirit of Christmas manages to miraculously instill itself in you anyway.